Sponsorship today is about a lot more than logos and banners, though you’d never know it from looking around most show floors. That’s why all too many B2B expos are dying, said Dave Lutz, managing director of Velvet Chainsaw Consulting, during a session he led at CDX18, held in Cleveland last month. Sponsorship can be a powerful marketing medium, but to be effective it has to make an emotional connection with attendees. 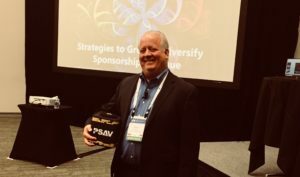 Lutz drew on his consultancy’s experience with a variety of organizations to develop a list of seven key attributes of a thriving sponsorship program. Here’s the flip side of his list. 2. The sponsorship is all about the sponsor and the host organization — not the attendee experience. “If the attendee doesn’t win, no one wins,” he added. If attendees walk out of a session after listening to a sales pitch in the guise of education, then instead of generating good will, the sponsor just lost potential customers. Instead, think about how you can use sponsorships to improve the attendee experience. 3. You spend all your time chasing down the small fry. With 80 percent of revenue coming from the top 20 percent of sponsors, “the best and biggest programs have fewer sponsorships, but they are larger sponsorships. Think fewer and bigger,” he said. 5. Your prospectus is one size fits all. While it’s fine to package your midrange to lower tiers, your top-tier sponsors deserve a customized approach. “Your larger sponsors want to be viewed as partners. They want to discuss ideas, not just pick up a prospectus. It’s in your best interest to have that conversation about how you can make them stand out while creating an emotional connection with attendees,” said Lutz. Also, they may have done sponsorships at other shows that they may want to repeat or build on for your conference. 6. You’re selling banners, window clings, wraps and logos à la carte. These promotions “don’t move target markets. They never did, even though we once thought they did. A logo doesn’t make an emotional connection.” Instead, bundle these items into the package you offer to your top sponsors, he recommended. 7. You only offer on-site sponsorship opportunities. Lutz said organizations should be extending their opportunities for providing value and visibility for at least 60 days pre-show and 30 days post. This could mean offering sponsorships for webinars, attendee engagement campaigns, white papers and other resources. One idea that bubbled up from the audience at the session was a virtual swag bag one association offers post-event. Attendees can click on sponsor logos at the designated Web page to access customized offers for discounts or freebies — whatever the sponsor wants to offer. Powersponsorship.com, a website run by corporate sponsorship strategist, trainer, speaker and author Kim Skildum-Reid that includes free downloads and other sponsorship-related resources.